On Thursday I made my usual pilgrimage north, only this time to Dartmouth College for a class on 18th century French binding before going to Women's Studio, and this time with two little babies the size of lemons inside. We wound our way up and tried not to be homesick. It's hard to put a finger on it but the road is different, the signs are different, the trees are different, the temperature is definitely different. It smells like summer and it smells like New England. Dartmouth looks like what my child self thought college would look like, before I went to MICA and Columbia and West Dean. 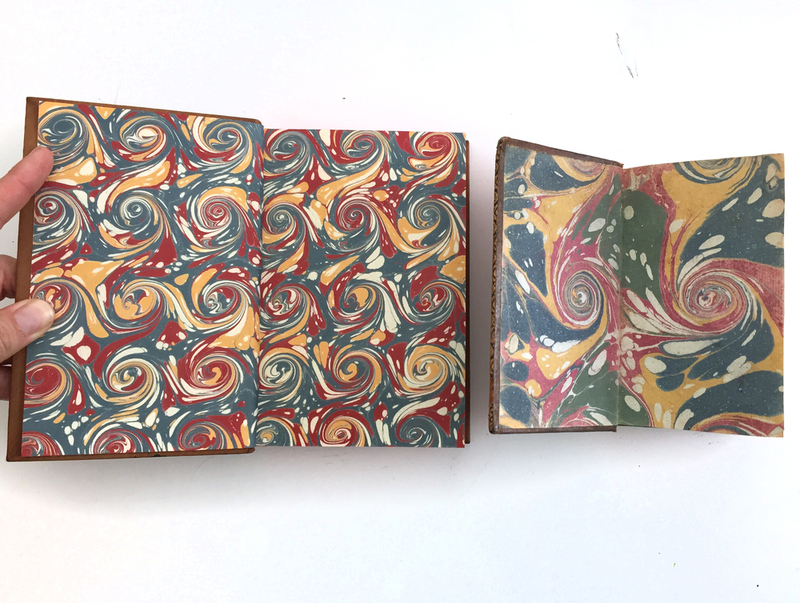 In two days, ten of us (three from Yale, three from Dartmouth, three independent binders, & I) made models of mid- to late-18th century French trade bindings like the ones below. The style is recognizable from a mile away: mid-brown calf, sponged or sprinkled, at least five raised bands, a characteristically-tooled spine, red edges, French curl marbling in yellow, red, and blue. Not that there aren't variations but one so often sees exactly this pattern. Structural features include a double comb lining, at least in theory; a particular lacing pattern; rounding, backing, and cutting in boards; sewing down the gutter of the marbled pastedown/flyleaf. "Always," I say, opening one of the example books and not finding any sewing. "Always," I say, reaching for another, shutting it just as fast. "Always!" I say, finally finding one that followed the rules. For textblocks, I adapted an 1827 binding manual helpfully digitized by Google. Most of us have enough blank bindings to last a lifetime of thoughtful journaling and it really looks the part when the insides match the outsides, even if on bright white machine-made paper. I opted for the shorter and fatter of the 1820s options, Manuel Complet du Relieur, but there is also an amazing one in the form of a "didactic poem" if anyone wants to practice their 19th c. French binding rhymes. A few colleagues wanted copies to bind on their own, not being able to make it to the workshop, so I had some extras printed and will offer them here for sale soon along with notes on how to put it all together. The marbling is the most beautiful marbling, from The Marbler's Apprentice—hand-ground pigments, lovely colors that don't sit heavy on the surface like acrylics. Pergamena sent the leather, which they managed to split to super super thin. I always think when covering of the first skin I ever bound with, which I picked out based on color and grain without Maureen around—turned out it was, according to her, the thickest, toughest goat that ever did live, and I spent the better part of a day paring it. It was a revelation when I learned about splitting machines. Somehow in only two days we sewed on raised cords; laced on boards; rounded and backed; scraped, burnished, and lined the spines; plowed; edge-colored; endbanded; pared; covered; and sprinkled. The only thing left is to put down the ends, which needed open drying time so had to be done at home in order for people to travel efficiently. (Bonus points for titling, tooling, and polishing at home, which I have all intention to do and probably won't.) And we still had time for bagels & ice cream. New (top) and old (bottom). Don't mind the generous sprinkles on mine! We recently brought the X-ray fluorescence spectrometer up from West Dean, for lessons with first-year students and research for second-year students at Camberwell, and two ICON workshops that I held at the V&A museum. In the evenings I used it on my 18th French book collection to further my research into pigments used in the marbling and edge decoration at that time. More spectroscopy than I've ever packed into a week; it was exciting when we got interesting results, and we opened up a few puzzles as well. Kim was looking to identify the red edge of her book, which turned out to be vermillion, probably mixed with an earth pigment given the amount of iron we also found. Tom also tried to ID the (printed) blue in this aquatint, but we didn't come up with meaningful results. In my French books, where areas of color are large enough, I'm systematically going through to collect spectra from each color in the marbling, or paste paper in those few cases, as well as the colored edges, to look for patterns and also to compare to contemporary accounts of what colors were used where. Spoiler alert: in the Diderot Encyclopédie, brazilwood is prescribed for red edges, but I have found only vermillion. In this case the identification is very easy; if mercury is present, it's vermillion; if not, brazilwood, carmine, or red ochre are possible. In the spectrum below, which is Kim's English book from the photo above, a mix of red ochre or bole and vermillion is indicated, which is consistent with the strong red-brown color. In our two quick ICON workshops, I talked briefly about the principles of XRF spectroscopy and how to interpret spectra, then we had a chance to use the spectrometer on all kinds of material, including brass furniture mounts, chrome-tanned leather, tooling on leather, green-dyed parchment, a painted Indian sitar, decoration on Japanned French furniture, foxing on paper, and pigments on a globe. 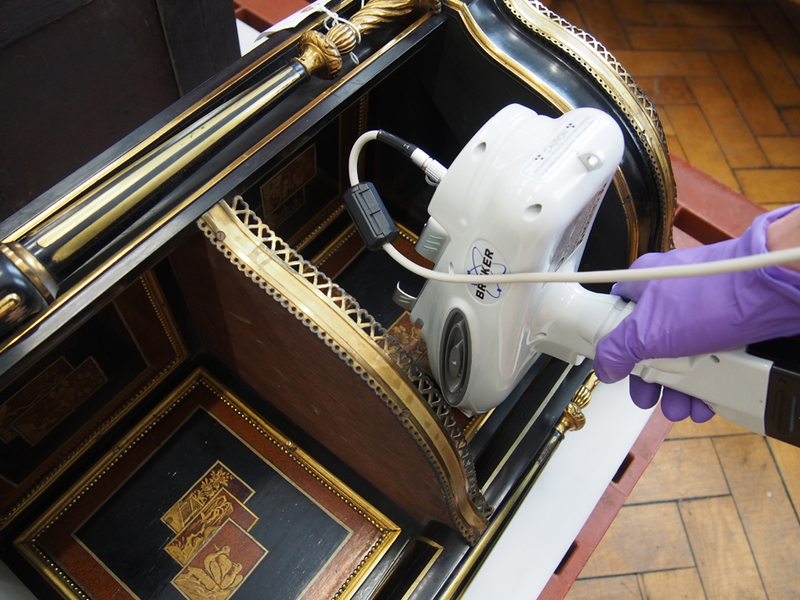 XRF spectroscopy is non-destructive and our instrument is portable, which does have some disadvantages but in the case of this furniture at the V&A, had a benefit over their benchtop model, which though more precise in sampling area, can't get inside the nooks and crannies of the objects.